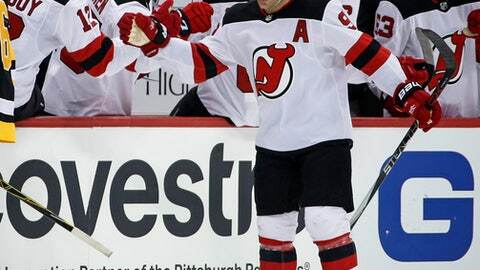 PITTSBURGH (AP) Taylor Hall just wants to contribute to the New Jersey Devils‘ playoff run. The Devils are happy that he’s contributing at a historic pace. Hall equaled the Devils’ franchise record with points in 15 straight games, Stefan Noesen scored the only goal of the third period and New Jersey beat the Pittsburgh Penguins 3-2 on Tuesday night. Noesen, playing in his 100th NHL game, broke a 2-2 tie with his ninth of the season five minutes into the third. He tipped Andy Greene’s attempt from the side boards behind Penguins goaltender Casey DeSmith. Hall equaled a career high with his 27th goal and had an assist. Hall, who missed three games with a hand injury, has points in the last 22 games in which he’s played, scoring 15 goals and 32 points during that span. He’s the fifth player in the last 25 years with at least one point in 22 consecutive appearances. Sidney Crosby scored his 21st goal and Matt Hunwick tallied his fourth for the Penguins, whose 11-game home win streak ended. The Penguins, who have won 11 of 15 overall, lost in Pittsburgh for the first time since Jan. 4. It was their longest home winning streak since a franchise-record 13-game run during the 2013-14 season. Kyle Palmieri scored his 17th goal for the Devils, who are fighting for an Eastern Conference wild card spot. New Jersey has won six of eight after losing eight of its previous 11. Keith Kinkaid made 36 saves for the Devils in his 26th appearance, matching a career high. DeSmith, a rookie, stopped 35 shots for Pittsburgh. He was recalled from Wilkes-Barre/Scranton of the American Hockey League on Monday. Penguins starter Matt Murray is out indefinitely with a concussion after he took a puck to the mask during Monday’s practice. Derick Brassard figures to be a key part of the Penguins’ postseason push. Brassard made his debut for Pittsburgh after he was acquired from the Ottawa Senators on Feb. 23. Brassard, who received an ovation before his first shift, primarily centered the Penguins’ third line, starting with Phil Kessel and Conor Sheary before mixing in Riley Sheahan later in the game. ”It’s going to take me a couple games to get a feel for my linemates and a feel for the way we play,” Brassard said. Brassard spent the last three days in Toronto sorting out immigration paperwork before joining his new teammates for Tuesday’s morning skate. The 30-year-old Brassard is in his 10th NHL season, but he said he was nervous when he arrived at the rink. Pittsburgh is trying to become the first team since the 1982-83 New York Islanders to win three straight Stanley Cups, and the Penguins aggressively pursued Brassard, who averaged 19 goals and 48 points during the last five seasons with Ottawa and the New York Rangers. NOTES: F Patrick Maroon did not play for the Devils. He was acquired on Monday from the Edmonton Oilers. … The Penguins signed F Patric Hornqvist to a five-year, $26.5 million contract that carries an average annual value of $5.3 million per season. Hornqvist, who won two Stanley Cups with the Penguins, could have become an unrestricted free agent on July 1. … The Devils sent G Cory Schneider to Binghamton of the American Hockey League for a conditioning assignment. … Pittsburgh recalled G Tristan Jarry on an emergency basis following Murray’s injury. … Tom Kuhnhackl returned to the Penguins’ lineup after missing eight games with a lower-body injury. Devils: Continue a three-game road trip Thursday at Florida. Penguins: Visit Boston on Thursday.